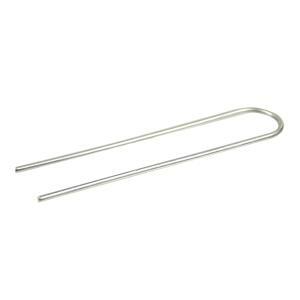 Our 6" heavy duty wire staples hold up to .940" OD tubing. Made from 12 gauge U.S. Steel wire (.116" diameter) These 6" galvanized landscape stakes work well in heavy or sandy soils. Staples (also known as hold downs or pins) can be used throughout your system as needed. Another great use for these staples is at the end of tubing or tape rows to anchor down end caps, which prevent them from moving when a system surges at startup.